Let me preface this with a story. Recently, I was on my way to a meeting when the bus I was riding was hit by a car. Fortunately, no one was hurt, but the car involved in the collision was wrecked and the family that was in the car looked to be, understandably, a little traumatized. It was a stressful situation, and everybody was in a bit of shock about what just happened. However, something about the way people reacted to the collision irked me. Many people got off the bus and began to film or take pictures of the aftermath of the collision. At the same time, many cars that drove by were either going really slowly or people were staring at the family and the scene of the accident. I understand something like a traffic collision is an exciting event to witness in our otherwise mundane lives. However, what is the purpose of filming it or gawking over such a thing? Furthermore, is it really appropriate or helpful to film or stare at people, much less crying children who were just involved in a situation as frightening as a crash? I don’t think so. Taking pictures or recordings for insurance purposes is one thing. However, I’m talking about people who gape and tape simply due to curiosity, people who have no stake in the insurance ramifications of the accident. 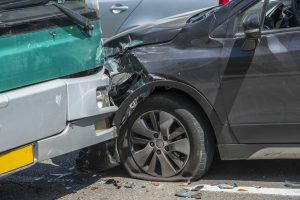 The term for people’s tendency to turn and stare at accident scenes is “rubbernecking” and it’s something I see far too commonly when driving. In this context, I often see people gawk or crane their necks trying to look at accidents while they’re driving to the point where they slow down or stop traffic to get a better look. This is a form of distracted driving, which as we know has the potential to be incredibly dangerous. When people decide to take photos or film these accidents, this is known as “digital rubbernecking.” It’s unsafe, annoying, and kind of rude. I mean, do you really have to get that good of a look or photo of a traffic collision? What are you going to do, put it on your Instagram? Just mind your own business and move on. I understand people are morbidly curious sometimes. Believe me, no one knows that better than me. However, being so preoccupied with something while driving is a major hazard. You could end up being involved in a collision yourself if you are more focused on an accident on the side of the road than the road in front of you. Furthermore, I think it is incredibly annoying when people do it. They act as if they have never seen an accident in their life. It’s not that interesting and there are more important things to focus on—like maybe your driving. I think it’s also important to consider people’s feelings after a car accident. Do you think if you were involved in a collision, you would want people staring at or filming you? I know I wouldn’t. The next time you’re driving and notice an accident, it’s normal to be curious and take a gander, but please refrain from staring or getting your phone out to take pictures of the scene. It’s rude, and you don’t want to be the next accident on the side of the road.